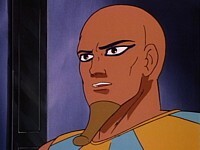 WIZZ-RA appears before CHEETARA. Disturbed by him, she considers asking the other THUNDERCATS for advice, but fears they will ridicule her. Eons previously, WIZZ-RA and MUMM-RA had fought a titanic battle high above the Egyptian desert. WIZZ-RA lost due to the accidental intervention of the SPHINX and was banished to the Seventh Dimension, permitted to reappear once every 7,000 years for just a single day. With him, he took the Enchanted Golden Helmet of mind control. 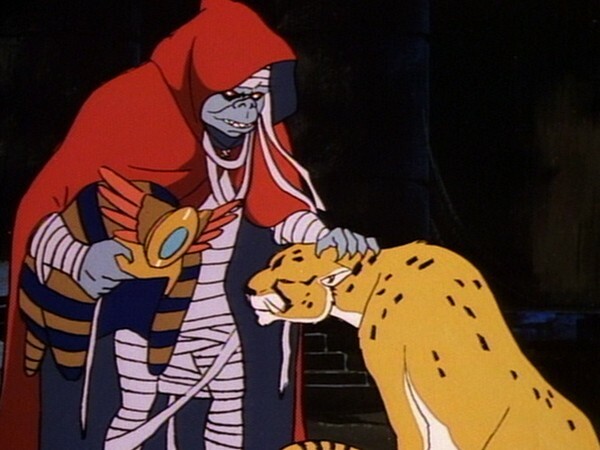 MUMM-RA brings a CHEETAH statue to life and uses it to entrance CHEETARA and seize the Golden Helmet when WIZZ-RA finally breaks through from the Seventh Dimension. With it, he gains control over the THUNDERCATS. He ignores CHEETARA, however, believing her to be powerless in her trance. 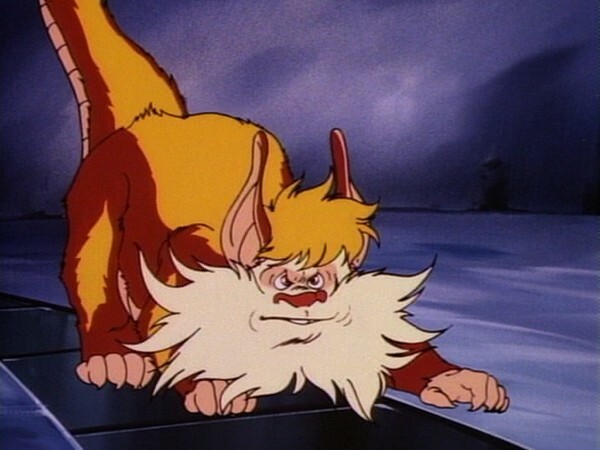 This over-confidence leads him to relax the spell on her and she and SNARF are able to retrieve the Golden Helmet, free the other THUNDERCATS and return WIZZ-RA safely to the Seventh Dimension. When Cheetara dreams and then sees Wizz-Ra for the first time, she is puzzled and confused. Instead of sharing her knowledge and confusion with the other ThunderCats and seeking guidance, she withholds for fear of being laughed at and dismissed. When we do not share our uncertainties and fears with those we feel close to, we run the risk of feeling alienated. And when we withhold telling them something that has happened or that we encountered that we may not understand or be troubled by, we run the risk of some misfortune occurring. True friends and people who care about us will not dismiss us, but will listen to us and help and support [us]. What we think and know and what we feel and experience is important. In this episode, Mumm-Ra, by magic power, is able to take over and control the minds of the ThunderCats. Sometimes in real life others convince us or ourselves that what we think and feel is insignificant and that we should think and feel as others do. This is a mistake, since each of us has the right to his own thoughts and feelings. We should allow ourselves to be confident and secure in what we think and feel and share the thoughts and feelings with others. 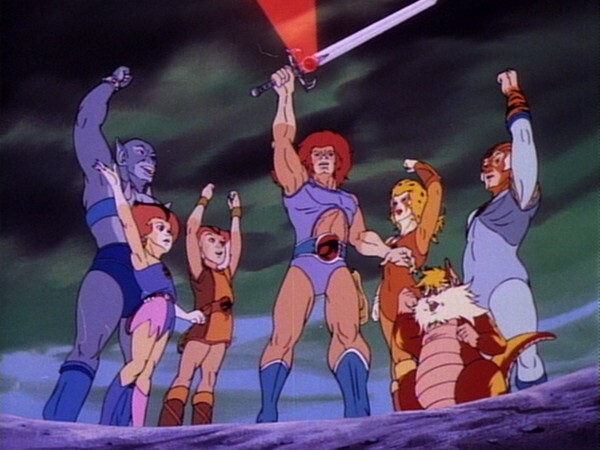 In many ways, “Dimension Doom” is an episode that collects all the best and most memorable elements of ThunderCats‘ original concept and weaves them together. Not only is the storyline for this episode highly exciting and memorable, but in many ways it is also one of the episodes that remains most faithful to the origins of the series. Perhaps the most significant detail to note about this episode is how many ancient Egyptian references and visuals writer Bob Haney and the animators were able to include. 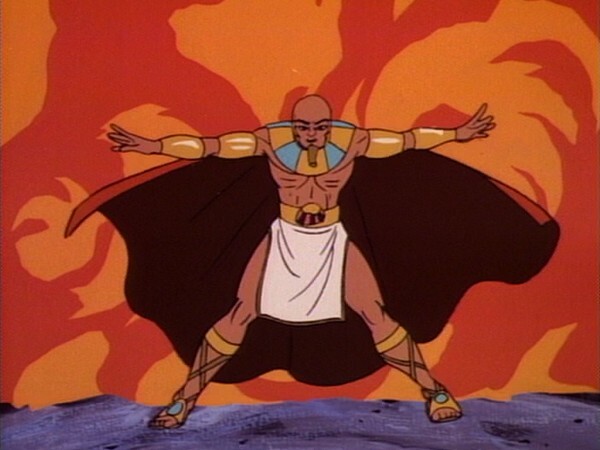 From Mumm-Ra and Wizz-Ra’s battle above the desert, watched on by a magical Sphinx, through to the quasi-Egyptian design of both Wizz-Ra and his helmet, this episode gives significant weight to the concept that Third Earth is a future, post-apocalyptic version of our Earth, and that Mumm-Ra’s pyramid and the Desert of Sinking Sands are located in the vicinity of what used to be ancient Egypt. These elements more than anything else give this episode a unique vibe that really adds something to the sense of danger posed by Mumm-Ra’s procurement of Wizz-Ra’s enchanted helmet, and also to the historic significance of Wizz-Ra’s appearance from another dimension. 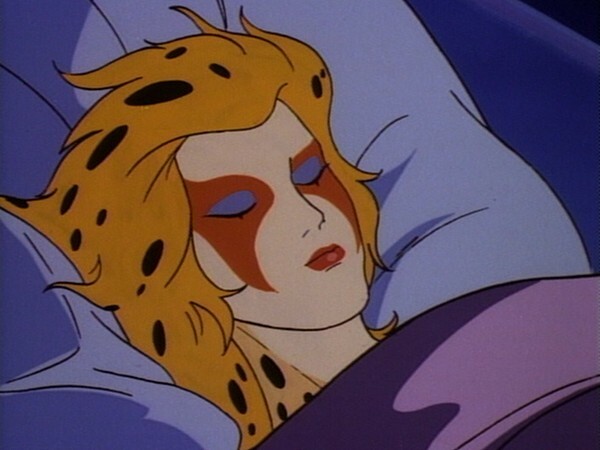 Despite her absence during much of the episode, Cheetara plays a big part in “Dimension Doom”. Bob Haney smartly introduces an element of uncertainty into Cheetara’s character, extending the doubt she has demonstrated around her sixth sense to a fear that the other ThunderCats don’t take her seriously, and will laugh if she tells them about the man in her mirror. Ultimately, though, she helps save the day, and her partnership with the dreamy Wizz-Ra ends with her saving his life, racing him back to the mirror doorway just in time. Wizz-Ra’s goodbye to Cheetara at the conclusion of this episode is even tinged with a hint of romance—enough to add a touch of poignancy to what could otherwise have been quite a straightforward and somewhat unimaginative scene. Brilliant touches like this are what make this episode so engaging and entertaining, and it’s a testament to the brilliance of experienced comic book writer Bob Haney that he should think to add these elements to this episode. 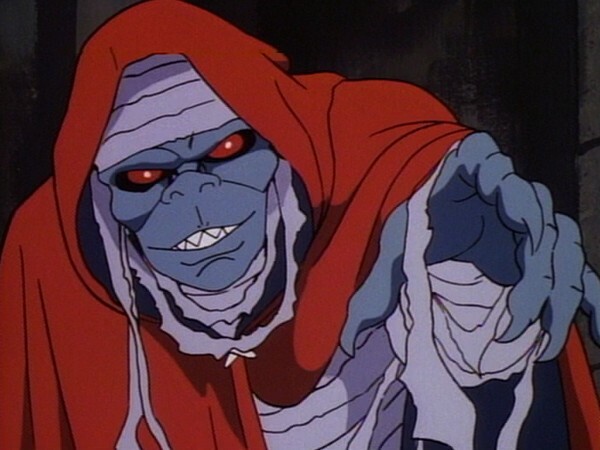 This episode is also a brilliant showcase for Mumm-Ra, who, despite never transforming into his Ever-Living form, which appears only in a flashback sequence, looks thoroughly formidable and menacing throughout. 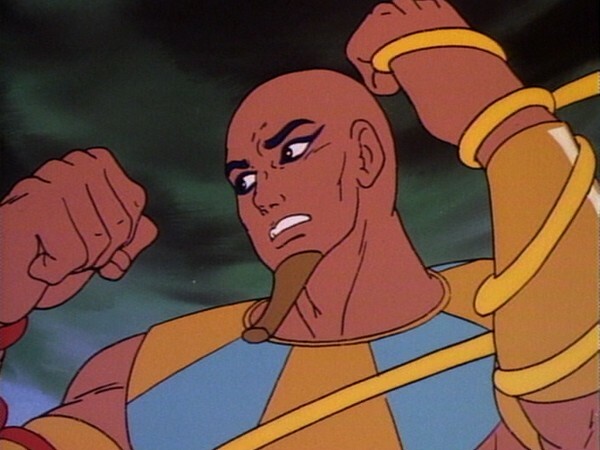 I have often said that a way of measuring how good an episode of ThunderCats is for Mumm-Ra is by examining how eloquent his dialogue is, and, sure enough, in this episode Mumm-Ra positively bristles evil, with sweeping, powerful dialogue that voice actor Earl Hammond fuels with all the venom he can muster. 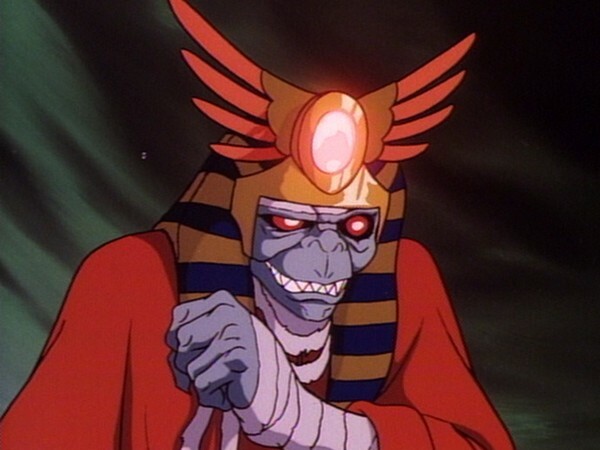 Although Mumm-Ra’s overconfident relaxation of his spell, which allows Cheetara to emerge from her trance, could be dismissed as a handy plot device, it is actually quite in keeping with Mumm-Ra’s portrayal in this episode, andit serves as proof that evil can be its own undoing. The more unbelievable coincidence on which the plot hangs, of course, is that the ThunderCats have built the Cats’ Lair—Cheetara’s bedchamber specifically—on the exact spot where Wizz-Ra will re-emerge from his dimension! What are the odds? Aside from this, it is hard to find any major weaknesses with this episode. 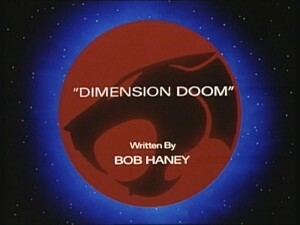 “Dimension Doom” serves as a testament to what makes ThunderCats such a timeless classic within the action-adventure animated genre. If it has a weakness not yet referenced, perhaps it would be that Wizz-Ra’s voice, in an attempt to imbue it with a sense of majestic power and nobility, is slightly stilted and wooden, and thus lacking the emotive qualities necessary to make the audience truly care about the character. Nevertheless, this is a minor gripe and not something that has ever spoilt my own personal enjoyment of this episode. 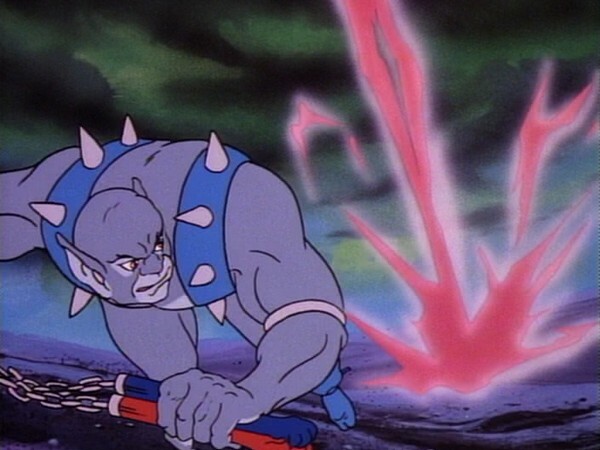 With an engaging plot, fast-paced and visually exciting action sequences, a menacing Mumm-Ra, and by being as true to the core of the ThunderCats concept as any episode could be, “Dimension Doom” is arguably one of the very strongest episodes from ThunderCats‘ Season One. Wizz-Ra’s helmet is referred to as the Enchanted Golden Helmet of Far-Nur. “The Unholy Alliance” and “Pumm-Ra” both established that Mumm-Ra was at least 1,000 years old, and that at least 1,000 years had elapsed between the eras of First Earth and Third Earth. Here in “Dimension Doom”, we learn that 7,000 years have elapsed since the days of Ancient Egypt, if not some multiple of 7,000 (e.g. 14,000 years, 21,000 years, etc. ), since it’s unclear whether this is the first time Wizz-Ra has returned. In this episode, we learn the name of one of the four Man-Beast Statues that represent the Ancient Spirits of Evil—the vulture-like statue is known as the Vulture King. When Wizz-Ra releases the ThunderCats from Mumm-Ra’s mind-controlling spell at the end of this episode, amongst their confused chatter Snarf’s voice can clearly be heard saying “I must have been asleep”, despite the fact that Snarf was not one of the ThunderCats that Mumm-Ra had enslaved! 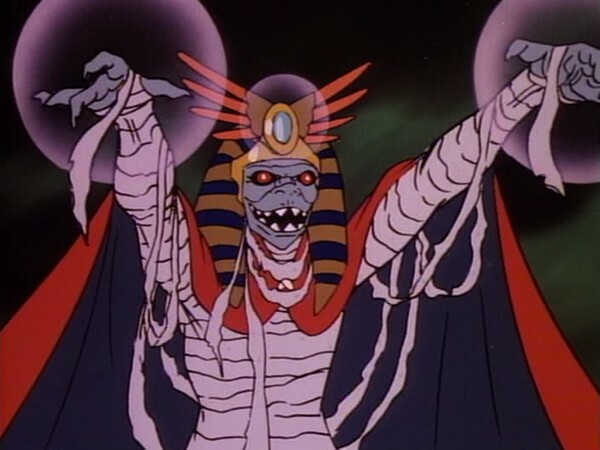 This episode is unusual for Mumm-Ra in that during it he never transforms into his Ever-Living form! 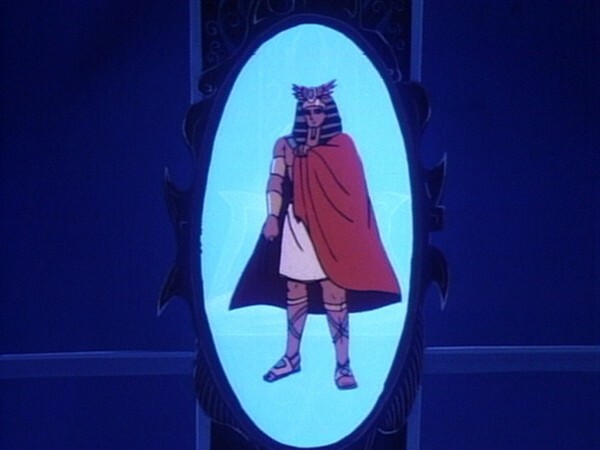 This would be a rare occurrence throughout the series, with Mumm-Ra’s transformation usually taking place whenever he would appear in an episode, although of course in the case of this episode it could be argued that he had no need to transform given the enhancement to his powers granted by Wizz-Ra’s enchanted helmet. This episode was featured in the F.H.E. Home Video release, “Spaceship Beneath the Sands”, alongside “Trapped”, “All That Glitters”, and the eponymous episode.